Gainesville, GA (December 5, 2017) - One of Georgia’s fastest growing marine dealerships, The Boat Shop was Centurion Boats’ first choice for a new dealer in the water sports-entrenched area of Lake Lanier and Atlanta. The Boat Shop prides themselves on focused customer attention and service. With the mission, “To ensure the highest possible customer satisfaction and loyalty by providing the highest quality boats, motors, product’s, and superior service to our customers. The Boat Shop has been helping Georgia boaters find the right boat to fit their family’ s needs for over 10 years. They plan to continue this charge by offering the perfect ride every time in the form of Centurion boats. The Boat Shop looks forward to spreading the World’s best waves, wakes, ride and more to the Atlanta area. 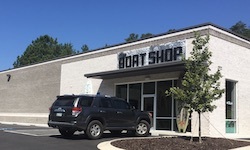 Visit: The Boat Shop in Gainesville GA, to experience a personal touch and attention to service that the Atlanta market has been missing. Stop by: 8615 Browns Bridge RD. Gainesville GA 30506.